What's it like to be a States of Incarceration tour guide? Editor's Note: This summer the HAL team was honored to have Lilah and Jazmyn as our interns. Together they helped us expand the HAL digital archive to include transcriptions of the interactive portion of the exhibit. 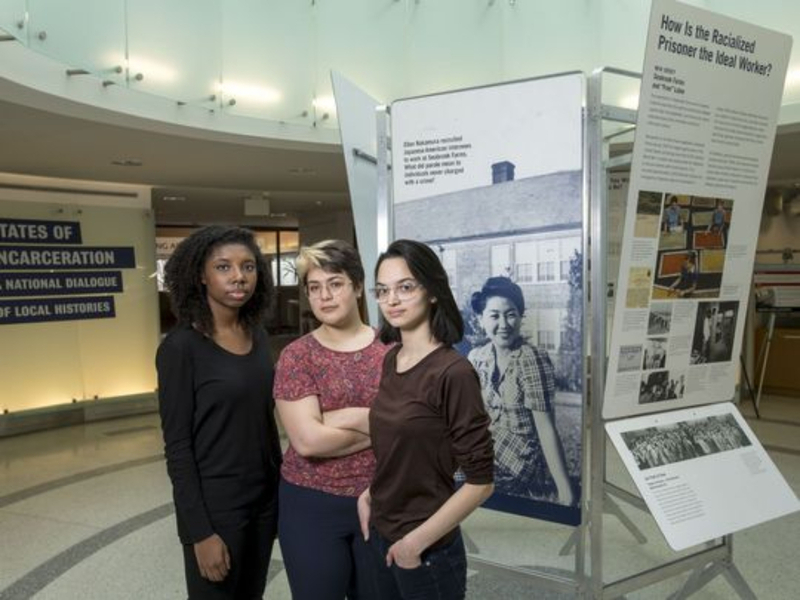 Lilah and Jazmyn, along with fellow Rutgers student Rachel Ferrante, served as tourguides at the Mabel Smith Douglass Library in New Brunswick this spring, where they facilitated dialogue among their peers as they visited the exhibition. In this roundtable, Lilah and Jazmyn tell us a bit about their experience. Their responses have been edited for clarity and length. Shana Russell (Program Manager, States of Incarceration): How did the two of you become involved with States of Incarceration? Lilah Orengo: As a criminal justice major, I had learned a lot about mass incarceration and felt that becoming involved with this project would allow me to have a more hands-on impact, as well as connect with others who wanted to create change. Jazmyn Carrington: As a political science major, States of Incarceration narrowed my focus within my major and tied into a lot of the classes I was taking at the time. I was interested in the topic of mass incarceration, and the project helped me expand my view while applying what I was learning in class to real life. SR: What was your relationship to mass incarceration before this experience? JC: Growing up I knew many individuals, including friends and family members, who were affected by mass incarceration. Despite my previous knowledge of the justice system before States of Incarceration, I found there was so much more I had to learn. SR: What was it like facilitating conversation with your peers about a complicated subject like mass incarceration? LO: Honestly, I was worried that the students whose family members were a part of the criminal justice system, such as COs, judges, or police officers, would take the message as a personal attack rather than a call for change. However, for the most part, the tour experience was positive. Students were engaged during discussions and those who were particularly interested wanted to know more ways that they could get involved. Granted, there were a few students who did not agree on the need for change, but the discussions were always fruitful since students debated amongst themselves and added new ideas to the discussion. JC: Facilitating the tours was one of my favorite parts of the project. I knew that my peers and I may differ in opinions at some points, but if I wanted to keep the dialogue open and fair I had to keep an open line of communication. I wanted the students and faculty that we spoke with to take away something new from the exhibit, even if their initial opinion didn't change. As long as everyone had respect for each other's beliefs, I knew we could keep a productive dialogue going. SR: What were your most memorable experiences while giving the tour? JC: In one of the tours that I gave, we had a student who had been previously incarcerated. His openness and honesty during the discussion really gave me and others a different perspective. To be able to hear his story and his journey really had an impact on me and it is something I will never forget. LO: My most memorable experience was when I was explaining the story of Kalief Browder during my very first tour discussion. There was intrigue on some students' faces and sadness in others, but everyone in the room was listening and engaged. I still felt nervous and I still felt the pain in the details of his story, but I could see then that having those difficult discussions was truly drawing attention to the injustices that are present in the criminal justice system every single day. SR: What do you think the impact of student participation in States of Incarceration has on the exhibition and the way its message is received? LO: Overall, I believe that student participation allows the message to resound more deeply with fellow students. It is not some professor in a class that you will never need again telling you about these issues. It is a fellow student who is backed up by researchers and students from all around the country. JC: A few students voiced that they felt more open to participating in what felt like a conversation rather than a lecture. Furthermore, an exhibit curated by students prompted other students to want to become involved in making a difference. SR: What is your biggest personal takeaway from this experience? LO: Everyday discourse can lead to change. JC: If we keep finding new and innovative ways to spread knowledge to the next generation, we are giving them the tools to create real reform.